The mobile phone is revolutionizing the economics of financial services. Whether a financial institution, banking agent, retailer or mobile operator, you cannot afford to under deliver on your mobile offerings. If you are not serving these customers, your competition will. The Money Mobility Suite™ from Mistral Mobile eliminates the technological barriers to providing mobile financial services. Money Mobility Suite™ works on any phone, on any network and anywhere—allowing you to reach and serve more customers, faster, and more cost-effectively than ever before. 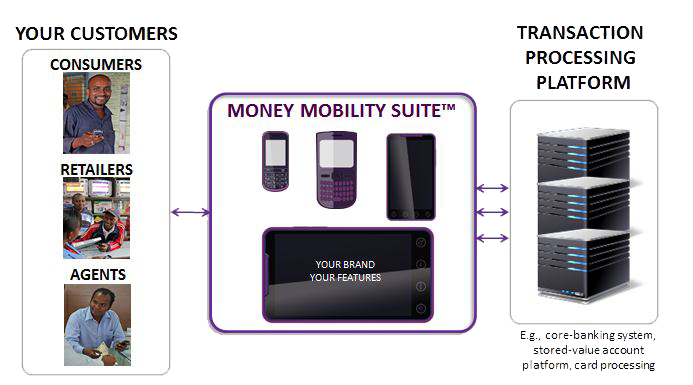 The Money Mobility Suite™ from Mistral Mobile gives you complete flexibility and control over your mobile services. With the Money Mobility Suite™, financial services can be delivered with the customers’ existing mobile phone whether the simplest or smartest mobile phone. No need for a data connection, or the latest smart phone technology. Critically, the platform integrates with your existing core systems, mobilizing any of your financial products and uses your brand. Mistral Mobile solutions remove the challenges of a constantly evolving marketplace by supporting every major mobile interface, for example: Android phones and tablets, Java-enabled phones, iPhone and iPad, BlackBerry, Windows Mobile, Symbian, voice-only phones and mobile browsers. Money Mobility Suite™ is designed by people who understand your business. As a result, Mistral solutions drive revenues more effectively and lower operating costs dramatically versus alternatives. Emerging-market bank account access solution enabling consumer retail banking services to everyone on their mobiles. Mistral Mobile has been involved in various mobile banking and mobile money deployments such as Nokia Money, and worked together with a number of leading banks across the growth markets. This unique experience is applied in the solutions offered by Mistral Mobile for the retail banks to mobilize their consumer banking services; and for payment service providers who are setting up mobile money businesses. m-Banking Solution™ is intended for banks or financial service providers offering mobile banking services for the retail customers. It enables the customers to use their mobile devices to use all the banking services via mobile channel. A complete Agent Banking solution to enable the rapid, cost-effective roll-out of agent services everywhere. Mistral Mobile has extensive experience in designing, setting up and operating agent-based financial services including regulatory aspects, and working with world’s most progressive banks in the agent banking space by providing solutions for them and bringing in the operational experience benefits as part of the solutions. This unique combination of commercial, operational, regulatory and technical expertise in the agent banking domain makes Mistral Mobile a unique provider in this one of the fastest-growing domains in financial services. m-Agent Banking Solution™ is intended for banks offering agent-banking services, microfinance institutions and credit co-operatives. It enables the agents to use their mobile devices to perform all the customer servicing such as account opening, deposits, withdrawals and payments on behalf of the customers. Emerging market –specific retailer payment acceptance tools for fast scaling of the acceptance network. M-POS is the fastest growing solution segment in increasing the card acceptance at the retail. Mistral Mobile works extensively together with multiple hardware vendors to bring unique MPOS solutions for highly cost effective increase in the card acceptance footprint in the markets. m-POS Solution™ is intended for banks and other merchant acquirers providing retail payment services. It enables the retailers to use their their mobile devices for accepting payments from customers, converting their mobile devices into M-POS terminals with additional payment features. Mobile banking and payments is exploding: Juniper Research forecasts more than 1 billion mobile banking users worldwide by 2017. Simultaneously, the roadblocks to mobile and online payments (NFC, BLE, QR) payments are disappearing with solutions such as host-card emulation (HCE) and secure-elements, clearing the way for explosive growth. With such growth comes risk, and mobile devices have become the next big enticing target for criminal hacking. The financial services and commerce industries require the highest degree of security to fend off the onslaught from hackers and fraudsters. m-Aegis™ is a one-stop, integrated solution to protect against a whole array of risks, including device spoofing, app tampering and man-in-the-middle attacks, by enabling multi-factor authentication of a mobile device and its associated mobile network identity. Unlike alternatives, m-Aegis™ does not create third-party or mobile-operator dependencies, meaning m-Aegis™ is globally deployable from day one, straight out of the box. With m-Aegis™ securing the mobile app, clumsy one-time-pins are dead. Today, users receive an SMS containing a PIN code which they then write, copy or have to remember, return to the site, then laboriously enter it; it’s annoying, error prone, and requires a dozen plus clicks. With m-Aegis, transactions are secured with just one click.